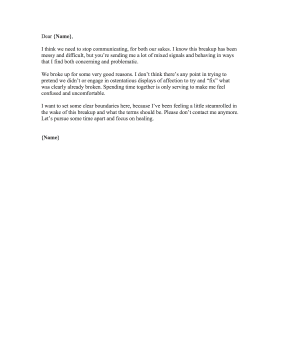 When an ex-partner is making you uncomfortable or will not leave you alone, use this personal rejection letter to demand space and respect. I think we need to stop communicating, for both our sakes. I know this breakup has been messy and difficult, but you're sending me a lot of mixed signals and behaving in ways that I find both concerning and problematic. We broke up for some very good reasons. I don't think there's any point in trying to pretend we didn't or engage in ostentatious displays of affection to try and "fix" what was clearly already broken. Spending time together is only serving to make me feel confused and uncomfortable. I want to set some clear boundaries here, because I've been feeling a little steamrolled in the wake of this breakup and what the terms should be. Please don't contact me anymore. Let's pursue some time apart and focus on healing.